In addition to the cute Storybook PJs I shared with you earlier, Little Toader also produces the Appeteether. These “Appetizer Teethers” are a fun and unique choice of teether for your little one. 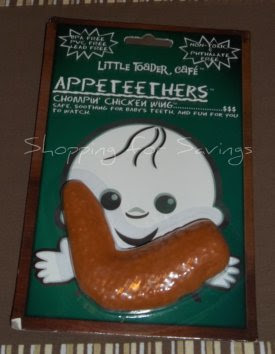 The Appeteethers currently come in two varieties (though a little birdie tells me additional selections may soon be on the way): Chompin’ Chicken Wing and Baby-Q Ribs. It’s kind of funny to watch your little one chomping away on their own BBQ rib.